Arbonaut is a Finnish technology company that develops information management and GIS solutions for managing forests and other natural resources. 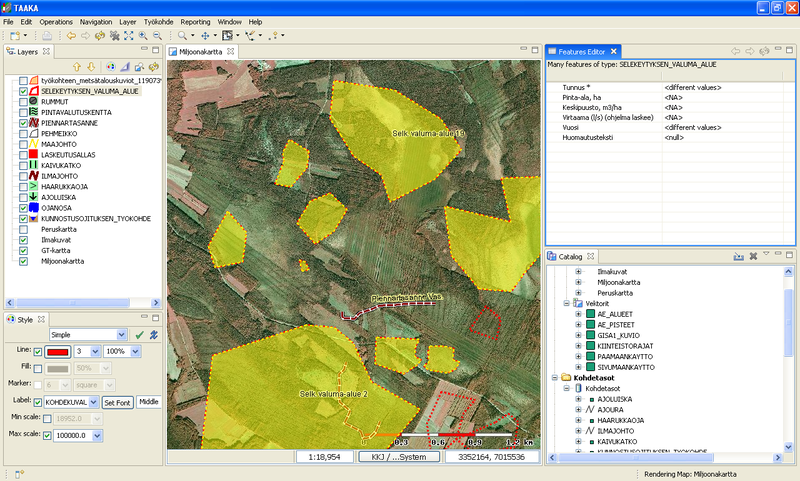 Using uDig as a framework, Arbonaut has built ArboGIS and Taaka, proprietary forest land management applications. Arbonaut has had a long term customer relationship to Metsähallitus (Finnish Forest and Park Service) and they needed a new tool to increase the effectiveness of forest planning. 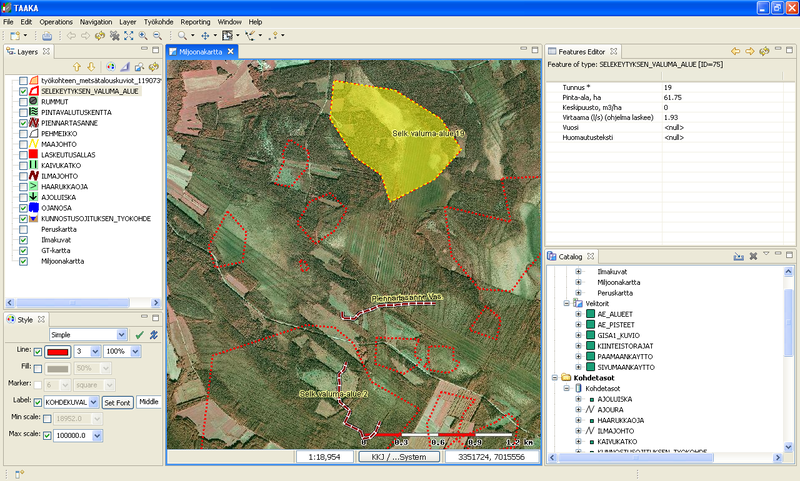 Arbonaut had the track record of producing remote sensing based forest inventory services. Arbonaut's image interpretation algorithm was utilized to automate the process of forest stand delineation. We had the algorithm, but we needed a modern GIS platform, which supports OGC standards. uDig met the requirements. Taaka is used by Metsähallitus (Finnish Forest and Park Services). They manage all the forest owned by Finnish government – that is quite a big piece of land! Taaka is used to increase the effectiveness of forest management and planning. Traditionally stand delineation is done manually (hand drawing or using awkward editing tools of GIS system). The new tool from Arbonaut automatically performs stand delineation. In addition, new fast-to-use editing tools make it easy to edit the stand borders in the GIS system. uDig has proven to be good platform to develop these advanced editing tools and other plug-ins. The inputs to the process are aerial images, with resolution of about 0.5 meters. In addition, usage of other GIS data is supported. Already existing data, like property borders and electric lines, are used as forced borders during the stand delineation process. In the future LIDAR data will be used also. LIDAR gives the 3rd dimension and thus delineation (classification) will be more accurate. Metsähallitus' existing stand borders are inaccurate (old aerial images, bad ortho rectification, coordinate system change, manual digitizing etc.). 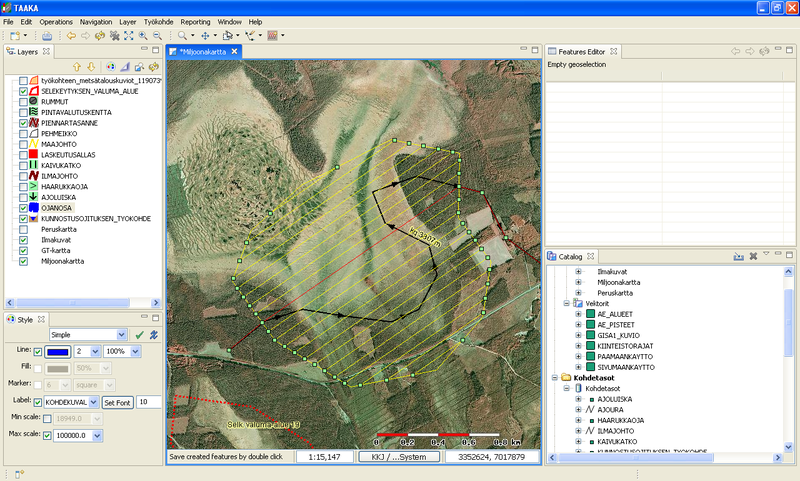 Modern forest management with PDA's with GPS receiver (system provided by Arbonaut) and timber logging with cut-to-length harvesters set high requirements for the accuracy of stand borders. Fixing all stand borders manually would have been far too expensive for Metsähallitus. The output is a new stand network (one forest stand is one polygon). There is a special inheritance phase in the process to copy the attribute data from old stands to the new stands. Borders are in the right place and topology is valid! At Arbonaut we tend to support open source if there is a true option available for commercial products. uDig seemed to be the platform that met most of our requirements and most important, it was implemented following OGC standards and modern technology. Thus we would be able use our Java knowledge and build our own extensions easily enough. The LGPL EPL license is suitable for software vendor's needs (we sell ArboGIS and Taaka as proprietary products). There is an active development community. uDig is not a lonely rider trying to solve every problem but instead a member of bigger open source GIS Java “family”. Support for various data formats from files and databases. Vector data support directly from the application and raster data support via map server, which is included in the package. Data import and export functionality including export of selected features. Stand delineation tool, which is based on automatic image segmentation algorithm. Automatic generation of stand borders. Forced borders, like property borders, can be used to control the stand delineation process. Topology preserving geometry simplification, which reduces the number of poipoints without changing the topology. Advanced and fast to use geometry editing tools designed for forest stand boundary editing. Attribute inheritance from old stands to new stands. Automatic and manual inheritance procedures guarantee the best quality of attribute data. Buffering, union, intersection and other geometry management tools for efficient managing of various layers. Geometry validation checking tools to improve the quality of the geometries managed in GIS. Attribute feature browser and editing tools to manage attribute information. Undo and commit (save) tools that help to control the working process. Customisable user interface that allows the user to place the components as preferred. Tools to categorize data and create theme maps in order to generate informative theme maps. Several simultaneous map editors (views), which make working more efficient. uDig is an open source desktop GIS application framework, distributed under dual EPL and BSD license. An out-of-the-box application, with the ability to view, edit and print files, database (Oracle, SDE, PostGIS) and Web Feature Servers (WFS). An industry-standard extension framework (RCP) for adding new functionality to the application. A rich toolkit of Java functionality, ready for developers to build on. Native support for Windows, Mac OS/X and Linux. uDig is developed by a world-wide community of contributors, with an open process and transparent decision making. Refractions Research is a consulting and systems integration company, with industry-leading exertise in enterprise geospatial applications. Refractions initiated and now hosts the uDig and, PostGIS projects, and continues to provide core development, training and consulting on the projects.